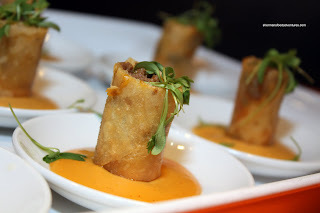 Fast-forward a month later, I was invited to the media launch of their new menu. The same items would be there, as well as some others. I decided to go and see for myself if they had made the necessary tweaks to the dishes I had tried. 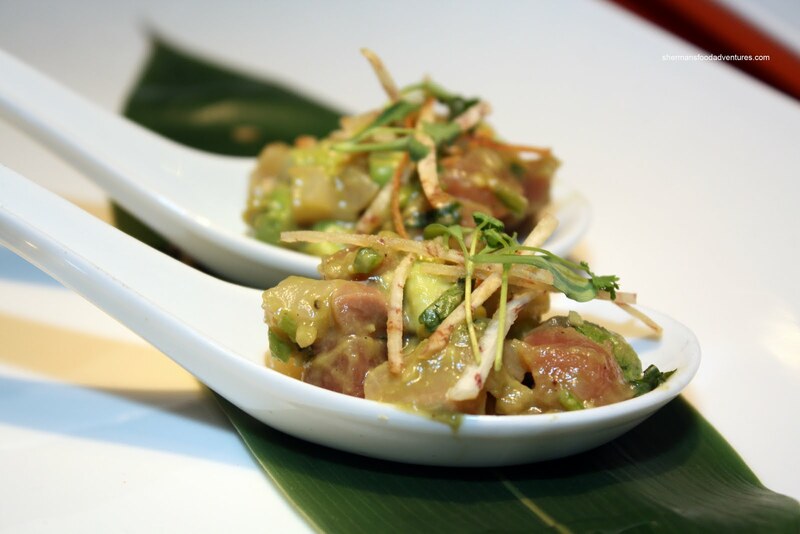 The first item was the Tuna Poke consisting of Ahi, chopped scallop, hamachi, creamy avocado and ceviche sauce. Adding some crunch is fried taro. With this item, they have been able to balance the flavours, unlike the first time I had it. Gone is the predominant cilantro. Now the flavours are much more clean with the tuna really shows up. Next up was the Jumbo Tiger Prawns with a spicy coconut sauce finished coriander temp ura. I liked this dish the first time I had it, so I'm glad they didn't change it. 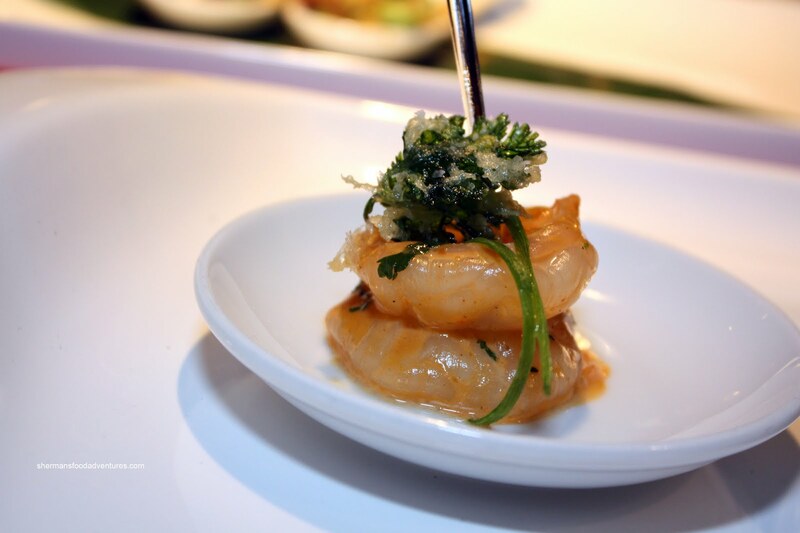 The prawn was perfectly crunchy while both the sauce and coriander did not take away from its natural sweetness. 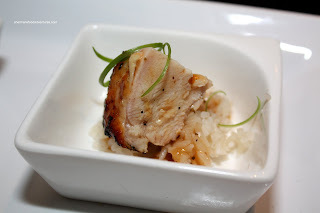 Then we were presented with the Lemon Grass Chicken with jasmine rice. This is usually prepared with dark meat since it remains juicy and tender. In this version, they used white meat and surprising it was not dry at all. Well-executed in that respect. For me at least, I would've preferred more lemon grass flavour. It could've been a result of the thick piece of chicken where the flavour wasn't able to penetrate. 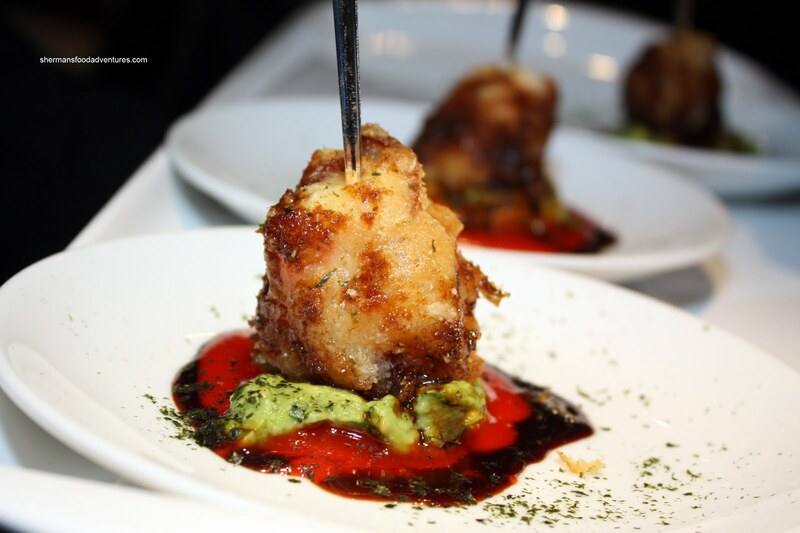 Now here comes the dish that was both good and bad the last time I had it - King Crab Tempura wrapped in bacon finished with crushed avocado, sweet soy, grana padano. Hey, it's king crab. A very delicious and expensive ingredient. And hey, it's bacon. I love bacon. However, when we fry bacon and it isn't crispy, it becomes leathery and not very aromatic. This is the case here. The large piece of crab leg meat was outstandingly sweet while the tempura was perfectly crispy. Furthermore the sweet and savoury sauce made for a delicious dish. But, as for the bacon, I'm still not a big fan. 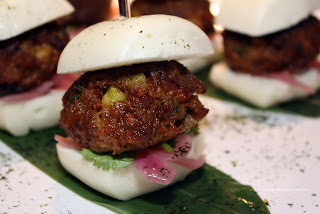 best version of an Asian slider so far, better than Terracotta and Bao Bei. 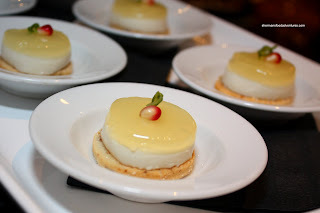 Finally, we were presented with a Pannacotta and a light Cheesecake. Honestly, I quickly scoffed those down since I needed to leave. 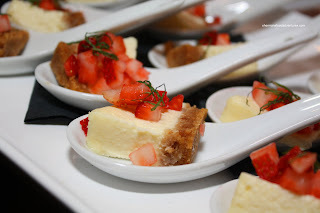 Didn't get much of an impression of the pannacotta; but the cheesecake was light and not too sweet. It was "fluffy" rather than being of the dense variety. Despite my initial reservations about accepting the media invitation, I was ultimately happy attending. Of course I realize the food was carefully prepared and of course I'll be waited on hand and foot. I get that. However, my main mission was to see if menu in the conceptual stage moved towards a satisfying final product. Furthermore, I wanted to see for myself if my initial impressions of Goldfish could change. 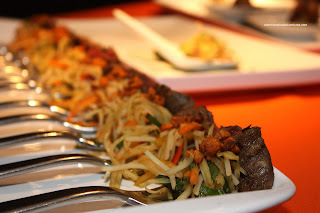 Honestly, the first time I ever visited the place, I found the food to be lackluster and lacking creativity. 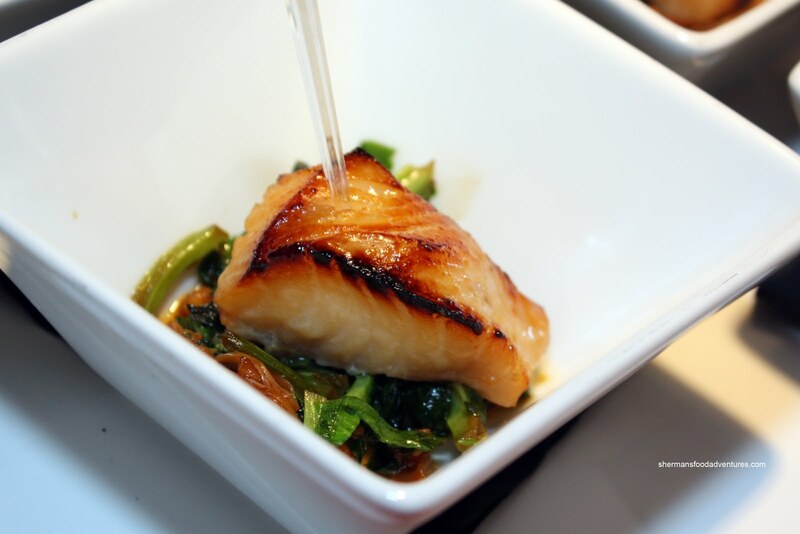 Sure, it was fusion, but honestly, all I got was a piece of fish steamed with ginger and onions. I could do that at home thank you very much. The new items are a combination of "safe" dishes and some that try to be different. We must also take into account what the target customer is as well. After all, this is Yaletown. If you were looking for inexpensive eats with no frills, you are in the wrong neighbourhood. Hey I get it, I used to live here. As mentioned in my Bao Bei post, there are times I do not want to eat in an environment with fluorescent lighting and linoleum floors, no matter how good the eats are. 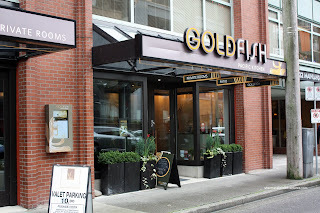 Naturally, I will reserve final judgment when I visit Goldfish independently in the future; however, this tasting has given me incentive to do so. Anyway, you have partially peaked my curiosity about this place. If you need a wingman to tag along, well, just drop me a note! Yes, a very good point Kim. Style and food don't necessarily mix. Yaletown is what it is. I guess we have to go there with those expectations. However, I truly believe that good food can still happen. You just have to know where to find it. Sure! Anytime, let's get a group!